Yesterday's ride had been planned for quite a while but had been put off due to average weather again and again so it was nice to get a good weather forecast that allowed the ride to be confirmed. After a night of very little sleep I finally got up just before 5 and started getting ready for the ride. I was out the door just before six and off to find an open petrol station before heading out to Ashhurst to meet up with the rest of the guys. When I got to Ashhurst they were all tucking into a decent breakfast before rugging up and hitting the road. Leaving Ashhurst we pootled over to Fielding and then through to Halcombe. There was a frost all the way through here with my temperature gauge showing a chilly 1 degree. Unfortunately this was a little too fresh for Sarge and he split off heading for somewhere warm while the rest of us lit out for Marton. From Marton the temperature gradually increased to around 7 degrees and we all warmed up a bit as kept on trucking through Wanganui, finally stopping in Hawera for petrol before popping into the local Suzuki shop for a free coffee (nice one!) and a chat. 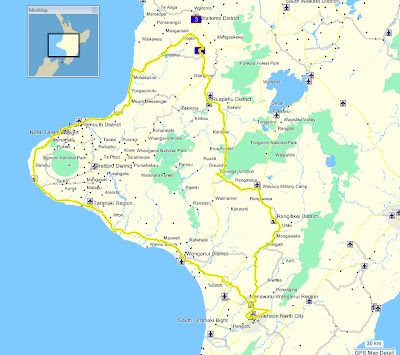 Coffee mugs emptied we left Hawera via the Surf Highway and continued on around the mount. The weather was definitely warmer but a cool wind didn't allow the sun to work it's magic quite as well as we would of liked - it's the middle of winter eh? Another quick pit stop in N ew Plymouth before heading North to some truly great roads. First up was Mount Messenger which even though damp in places was a blast with little traffic and some fantastic twisty roads. Not far North of Mount Messenger we pulled over at a lay by so someone could have a smoke and were surprised by another Kiwi Biker pulling in and stopping for a chat. All talked out (yeah, right) we took off for the next great piece of road - the Awakino Gorge. This is a great ride with plenty of delicious curves and not much traffic. Everyone had a great play through here and then it was finally time to stop for lunch in Piopio. Bikes and riders all feed & watered it was time to start making our way back home. 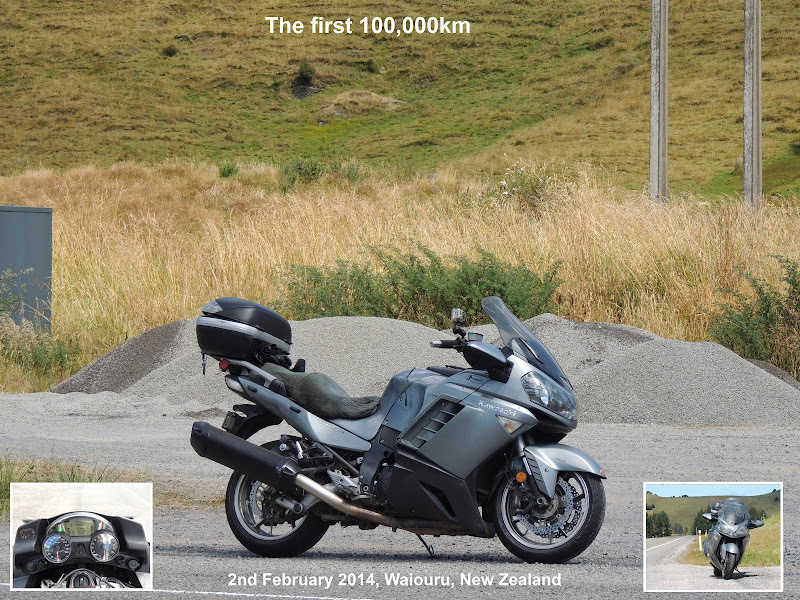 The ride through SH4 to Tamarunui is always a great ride though in places there was grit on the road to stop cars from sliding around on ice and keep things interesting for motorcyclists. At National Park we hit rain. Rain of the wet and freezing kind. Not mint. It was a very wet and cold ride through to Ohakune, so much so that Cowboyz had to stop and defrost his fingers. It turned out that his woollen inner gloves were stopping the heat from his heated grips getting through to his fingers - he finally sorted that out later. Leaving Ohakune we again hit rain and the roads were very wet all the way to Waiouru. South of Waiouru the temperature dropped to around 5 degrees and we battled wet conditions nearly all the way to Taihape we we stopped for a hot drink before the last leg home. 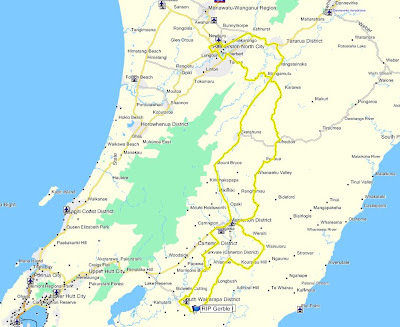 Pretty average weather this weekend but today was the pick as far as riding was concerned so Mark and I decided to hit the Rangiwahia/Vinegar Hill loop. We left Palmy in reasonably fine weather with just the odd spit on our visors and relatively dry roads. By the time we were north of Kimbolton we started hitting wet roads. No snow this time but some quite slippery patches and even one patch of grit that must have been laid to combat ice and slow up the motorcyclists. Leaving Rangi we started getting pretty persistent drizzle and by the time we hit Mangaweka we had been through quite a bit of rain. Heading homewards on SH1 we were pretty much in and out of the rain most of the way but still turned off to take in Vinegar Hill which ended up being in pretty good condition and a lot of fun even if wet in places. Overall it was a great ride, certainly warmer (if wetter) than last time I went through and I had a ball regardless of the weather. Yep, electric bikes at the IOM this year. 87mph average and 1 lap is a long way from 131mph of the petrol-heads but pretty interesting. After being cancelled last weekend due to nasty weather it was great to wake up to a fine day and get ready for the Fielding Riders' ride through to Martinborough. I left home just before 9:30 and topped up the bike on the way out town. The meeting place was at the bottom of the track and when I pulled up I met up with Al and a couple of guys who had braved 1 degree temperatures on their ride over from Masterton. Not long afterwards the rest of the gang rolled up and we didn't muck around too much before we got on the bikes and hit the track. Al and I had a nice blat over the track and after waiting at the bottom of the hill for a tick, we tagged back on behind the rest and continued on to Pahiatua. In Pahiatua we had a brief stop so that everyone could catch up and a warning was passed onto us by Radar about some dodgy conditions further on down the road. Soon we were back on the road heading out the Mangaone valley. The pace was kept at a sensible speed as the road was damp in places and can be prone to the odd bit of loose metal. Our next stop for a re-group was at Alfredton and the general consensus was that things were a bit chilly but the riding was good. On down Route 52 we went and it was great riding spoilt only by a bit of misty rain in places. Another quick re-group at Te Ore Ore and then we were off into the unknown (well, for me anyway). We turned off Castle point road and rode through some great country roads to Wainuioru, Gladstone & Longbush. Just before we got to Martinborough Bonez started waving and wobbling around a bit and pulled off the road. When we all stopped he gave us the bad news - Gerble (his GB400, see piccy) had died. The bike had had some kind of seizure and the rear wheel had locked up on him and he had to pull in the clutch so that he could stop safely. Bonez tried kick-starting the bike and we pushed it around a bit but could not get it things to turn they way they should - damn! Poor old Gerble ended up getting towed to a farmer's house and Bonez took the co-pilot's seat on the Connie for the ride into Martinborough. On the way into Martinborough we got to enjoy a few nasty little showers so the hot lunch and drink was quite welcome when we stopped. After lunch we took a quick diversion to have a peak at the Stonehenge replica before cruising into Masterton. As we'd had a bit of rain here and there and there were quite a few cold bods we decided to flag the excursion to Mauriceville and took the main road back to Pahiatua. In Pahiatua we stopped for coffee and a chin-wag before the final leg home. For the last little squirt Leonie (who was feeling the cold a bit) handed Bonez the keys to her mighty 225 and stole Bonez's place on the Connie. The rest of the ride was just a quiet pootle but the highlight was Bonez pulling off a wicked passing move in the gorge where he took out 3 bikes in one hit on the little Yamaha - nice. Nothing too outrageous but trials is always cool!